I’ve been fairly harsh on the last three issues of the Amazing Spider-Man “Learning to Crawl” miniseries and was almost dreading the idea of reading the finale this week and trying to come up with something to say that wasn’t overly whiny or obnoxious. 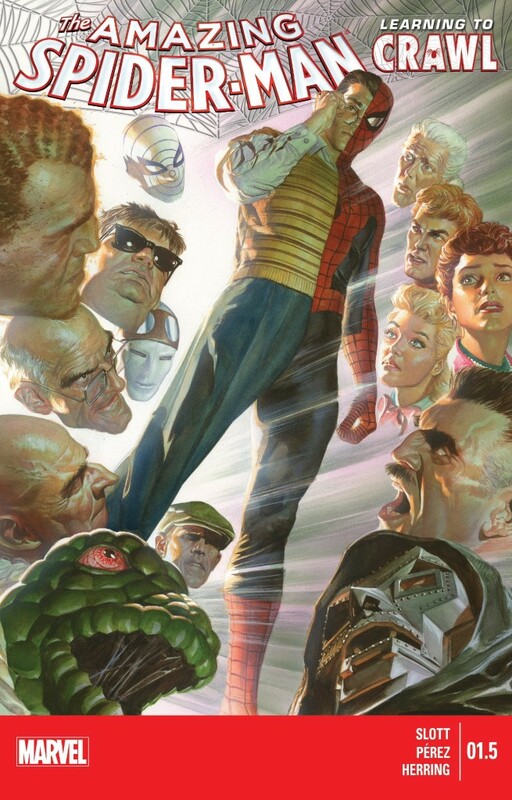 But in turns out my fears were misguided and that, standing totally on its own, I actually enjoyed ASM #1.5, and found it to be a worthwhile punctuation mark on this otherwise uneven and ultimately forgettable experiment. ASM #1.5 does feature its fair share of flaws and raises questions that it doesn’t bother to answer about some characters/premises and their roles in the Spider-Man mythos, but the comic is also the joyous, celebratory story about Spider-Man’s earliest days that I quite frankly was expecting when “Learning to Crawl” was first announced earlier this year. Whereas previous issues were unfocused and inconsistently plotted and characterized, ASM #1.5 seems to have a much better idea of what it wants to be and what its trying to say. And because of that, I find myself far more willing to look past some of the things that I would have otherwise picked apart in a previous issue. The heart and soul of this comic is of course the interaction between Peter and Aunt May – two characters that have certainly shared some wonderful moments together over the past 52 years of Spider-Man comics. I wouldn’t put ASM #1.5 in the pantheon of great May/Peter conversations (like “The Conversation”), but this comic certainly answered the bell, especially after Slott was hyping it a bit on Twitter in the days/weeks before the comic was published. I find myself saying this with frequency, but it bears repeating – especially when we’ve had a run of issues that move away from this idea – but Slott is a superior writer when he takes a step back and allows moments and emotions to evolve organically, rather than trying to hammer a square peg into a round hole. The Peter/May sequence works here because these are characters we know and love and they were given a chance to act in a fashion that validates that affection we have for them as readers. 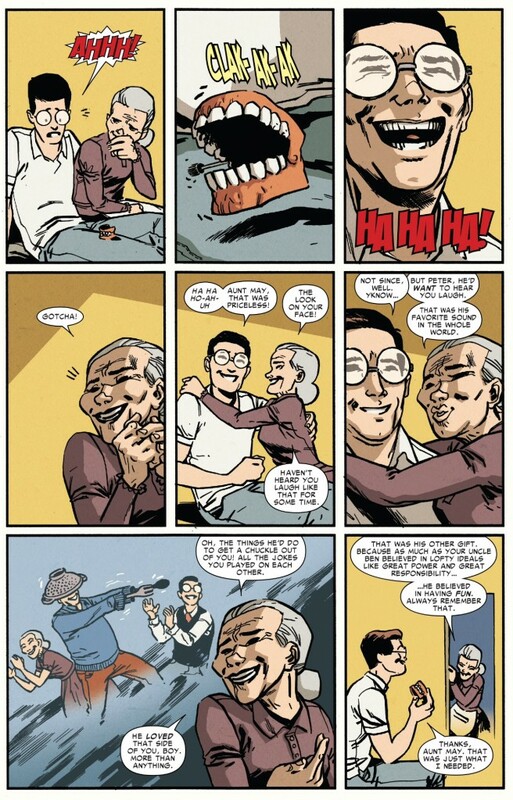 Even when the script took a very unexpected and borderline bizarre turn involving a joke May plays on Peter with “fake dentures,” the emotion of the scene bubbles over and its impossible for me to look at these pages and not smile. The origin of “with great power – there must also come great responsibility” remains one of the great misunderstandings in the world of comic books. Despite how it’s been depicted in cartoons, movies and even alternative versions of Spidey in the comics over the years, in the original Amazing Fantasy #15, Uncle Ben never said those words to his nephew in some sort of teaching moment. Those words were conceived by Stan Lee (who I’m sure got them from somewhere else) and thus a legend was born. But “Learning to Crawl,” does attempt to fill in the gaps and confirm that while Ben never said these words in Amazing Fantasy, it’s a certainty that he said it at SOME point in history, likely multiple times. Ben’s great lesson is then augmented by the fact that Peter realizes that in his past actions, he was more obsessed with trying to honor his uncle’s death, rather than the way he lived his life. 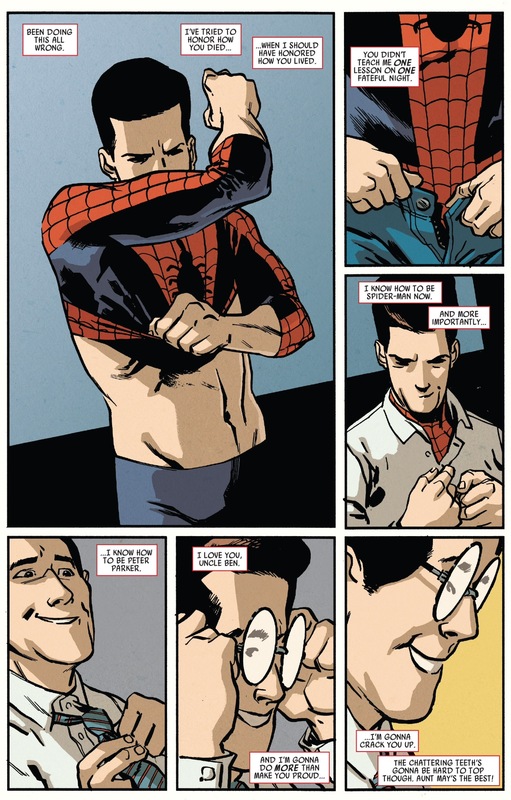 I thought this was a very worthwhile wrinkle to add to Peter’s education as a superhero and a human being. Remember, the power/responsibility mantra was not some sort of dying wish imparted on Peter by his uncle but a life lesson. And the only way you can embody a life lesson is by living on it, and not dwelling on a past that cannot be changed. Perhaps the script focuses a bit too much on the “humor” element of the Spider-Man mythos. 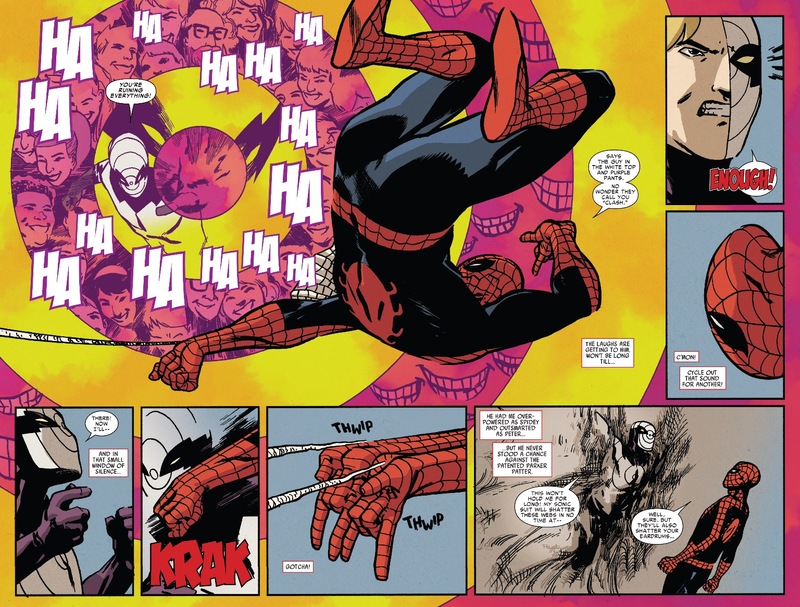 Between May’s fake teeth and the final battle sequence between Peter and Clash, there’s certainly a fair amount of jokes and one-liners that almost border on “forced” territory, but again, it’s forgivable when a comic is at least joyful and confident in its own skin (or paper). Besides, such an approach retroactively gave us the birth of one of the more famous unexplained Spidey tropes, the “courtesy of your friendly neighborhood Spider-Man” letter he often leaves clipped to fallen opponents. 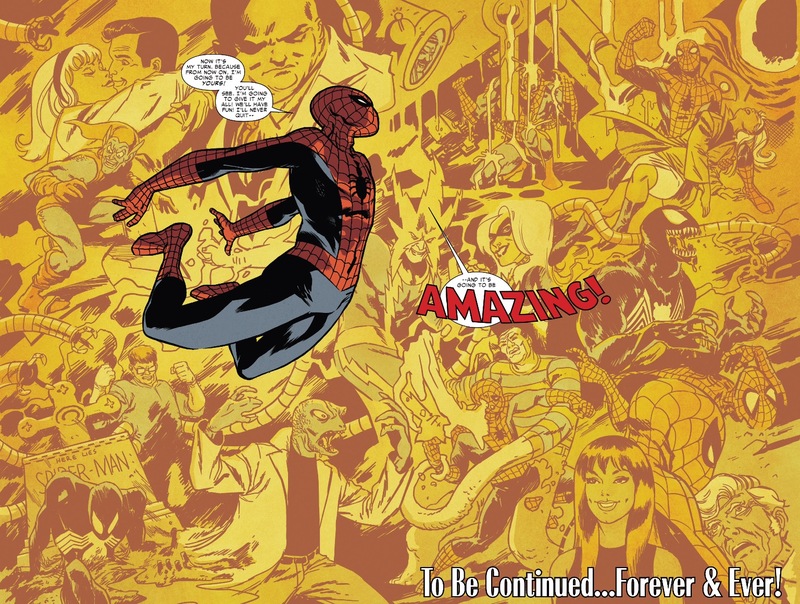 ASM #1.5 does assumingly mark the end of the Clash/Clayton Cowles era, and while I was never a huge fan of the character to begin with, I do think he got enough of a sendoff to leave that section of the Spider-Man mythos alone for the indefinite future. Ultimately, Clayton is just another example of a villain who exists primarily as the antithesis of Peter – all of the power, none of the responsibility. As such, there’s nothing about Clash that sets apart from other more iconic (and well conceived) villains beyond his age. Still, I found the final fight between the two to be satisfying, primarily because Peter was able to engineer a solution that didn’t involve stealing equipment from the school, or going to far to the edge of mad scientist territory in terms of creating a bigger and stronger weapon. If that’s not an embodiment of power/responsibility, I don’t know what is. I can’t really get too crazy and say the quality of ASM #1.5 was enough to wipe away my problems with the rest of this series, but I do think if Slott had somehow found a way to bridge the bookend issues of “Learning to Crawl” with something more focused and concise in the middle, a much better storyline would have been produced. It goes to show that “Learning to Crawl” did have a point, but perhaps there were some other issues that mandated that it play out the way it did. You make some nice points for the issue, and I have to agree that Aunt May was a delight here, but I can’t shake off the feeling that this whole sort of life lesson had been done much better by Paul Jenkins. And he didn’t have to reinvent some classic storylines to tell them. Well, my feelings for the series as a whole are hardly a ringing endorsement, but rather that I would have been far more positive about Learning to Crawl if it maintained a tone and pace similar to what the final issue gave us. But agreed, these lessons have been attempted by other writers with varying levels of success, Jenkins being a superior one.